Stacy Carlson is is the Vice President and Program Director – Florida of Helios Education Foundation in Tampa, Florida and a member of the Florida Philanthropic Network. This interview was conducted over email by Dan Brady at the Forum of Regional Associations of Grantmakers as part of our PolicyWorks for Philanthropy interview series. Helios Education Foundation is focused on creating opportunities for individuals in Arizona and Florida to succeed in postsecondary education. Accomplishing that vision requires strategic investment along the entire education continuum with a focus on creating a college-going culture and advancing academic preparedness for all students. Investment for Helios doesn’t stop at financial investment. The Foundation recognizes that the opportunity for lasting, sustainable change requires financial investments, as well as expertise and leadership. Within that purview of activity, we also see the opportunity for engaging in public policy issues. When appropriate, the opportunity for sustainability rests in building a public policy platform that supports the depth and breadth of evidence-based practices to positively influence broader reform. What does working with Florida Philanthropic Network allow you to do together that you couldn’t do yourself? What does working with FPN make possible? The Florida Philanthropic Network provides a network of funders who can come together in a safe space to learn, test new concepts and consider opportunities for collaboration. Through its statewide presence, FPN elevates the collective work of the philanthropic sector which gives the sector more credibility and influence in the statewide issues we support. The organization takes the individual priorities and actions of a disparate group of foundations and finds common ground from which to build a relevant case for why the philanthropic sector matters. Vicki Rosenberg, formerly of the Council of Michigan Foundations and now of Vicki Rosenberg & Associates recently posted an account of CMF’s diversity efforts and the evolution of the D5 Coalition on BoardSource‘s blog. To understand how foundation boards can become more diverse and inclusive and why doing so matters, CMF and BoardSource co-hosted focus groups with diverse foundation trustees ranging in age from 35 to 75. Not one of them fit the typical foundation boardroom demographic in Michigan: White (80 percent), male (60 percent), and age 50 or older (66 percent.) Findings are reported in Diversity and Inclusion in the Foundation Boardroom: Voices of Diverse Trustees published by CMF in 2012 as part of its Transforming Michigan Foundations Through Diversity & Inclusion initiative. What did we learn from these “outliers” about what it takes to build a diverse and inclusive board that adds value to achieving the foundations’ mission and goals? becoming a diverse and inclusive board takes unflagging commitment, training, new policies and practices, recruiting beyond traditional networks, and patience. And, creating safe space for honest and sometimes difficult conversations is essential. Diversity with the expectation of assimilation vs. inclusion perpetuates tokenism, bias, misunderstanding, and frustration. Read Vicki’s full blog post at BoardSource’s Exceptional Boards blog. A highlight of recent activity from the 15 regional associations currently blogging. It’s a great day at Philanthropy Ohio! In With the New, Out with the Old…Really? Other regionals blogging include Arizona Grantmakers Forum, Colorado Association of Funders, Florida Philanthropic Network, and Southeastern Council of Foundations. Forum Board Chair and Council of New Jersey Grantmakers President Nina Stack has a new post up at the Geraldine R. Dodge Foundation’s blog in which she addresses the need for philanthropy to engage legislators on public policy issues impacting the sector. Stack recounted her recent participation in the New Jersey Chamber of Commerce’s“Walk to Washington,” an event at which business, policy, and social sector leaders discussed recovery efforts from Hurricane Sandy. Stack goes on to encourage foundation leaders and regional associations to take the opportunity to share their story at this year’s Foundations on the Hill. Read the full piece here. To assess the outlook for grantmaking in Minnesota in 2013, Minnesota Council on Foundations conducted its annual Outlook survey, asking foundations and corporate giving programs to predict how their 2013 giving will compare to 2012. According to report, Minnesota grantmakers predict a relatively stable 2013, with grantmaking estimated to be flat or increase about two percent from 2012. A total of 104 organizations responded, representing 75 percent of annual grantmaking in the state. Ohio Gives 2012, released by Philanthropy Ohio, showcases and tracks the strength of the Buckeye State’s philanthropy. It includes data and trends on individual and foundation giving, and information on donor advised funds and on federated funds including United Ways. According to the report, cCharitable giving by individuals rose 7.5 percent in 2010 while giving by foundations fell 1.6 percent. The Center for Nonprofit Management, in partnership with the Conference of Southwest Foundations, published this report based on research from a variety of local and national sources and data focused on the 16 counties of North Texas. The 2012 report adds information about grantmaking and giving trends in North Texas. The report as a whole is designed to build awareness about the state of the nonprofit sector in North Texas and to educate and inspire one to continue or expand support of the nonprofits in the community. This Delaware Grantmakers Association report is a companion report to Philanthropy in the First State, released in 2009. Both studies examine the nonprofit organizations active in Delaware and the individual giving and organized philanthropy that support them. The New Mexico Association of Grantmakers released its third report on Philanthropy in New Mexico. The report provides information on grantmaking and giving in New Mexico based on 2009-2010 data, and survey responses from New Mexico-based funders and out-of-state foundations giving in New Mexico. This report also provides a comparison with 2005-2006 data from the last report. 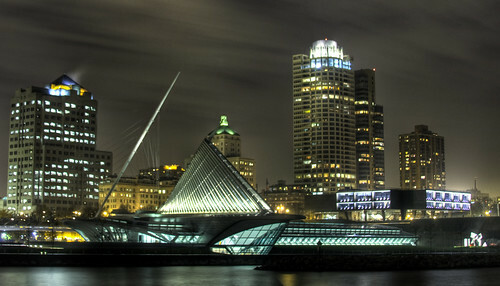 We are excited to announce that our 2013 annual conference will take place July 29-31 in Milwaukee, WI! The Forum’s Annual Conference is a key opportunity each year for regional association staff to come together for skill building sessions, networking, and thought provoking discussions with philanthropy leaders. The PolicyWorks Institute will follow the conference on July 31-August 1. Please stay tuned for a hotel announcement in the coming weeks. We hope to see many of you there! Image used under creative common license, courtesy of ThreeIfByBike on Flickr.